With his seminal debut single ‘The Trumpeter (La Musica)’ in 2011, Ray Foxx helped reinvigorate house music. 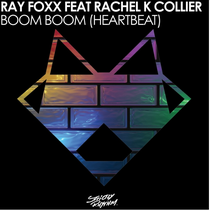 Now the Foxx is back with a little help from London based singer and songwriter Rachel K Collier who provides the vocals for the new single ‘Boom Boom (Heartbeat)’, a sensual and enticing piano driven and funk infused house track. Along with the main mix is a pretty intensive remix package: Taiki & Nulight tackle the bass house vibe, Australia's Tom Piper delivers a deep and techie twist, Sami Wentz offers the deeper but still funky interpretation, Crazibiza turn out a summery beach house vibe and upcoming UK producer, Jett, builds an hypnotic garage inflected groove. The single has already had huge support from BBC Radio 1's Danny Howard, MistaJam, 1Xtra's DJ Target and Cameo, Kiss FM's Steve Smart and The Wideboys and Capital FM's Andi Durrant. Look out for it on Strictly Rhythm.